- To view song lyrics, click on the "LYR"
- To view song guitar tabs/chords, click on the "GTR"
This is mostly a re-release of tracks from "On A Full Moon" - the only two songs not found on "On A Full Moon" are "Second Chance" and "I Can Love". 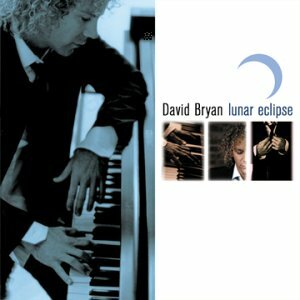 Being an avid Bon Jovi fan and having listened to all of their albums for a quite long time I anxiously awaited the new solo album "Lunar Eclipse" from David Bryan. Since I've never heard his first album "On A Full Moon" that he put out in -94 and I really didn't know what to expect. What he had done on this album both struck me as a little surprising and admiration. You really couldn't imagine that David, being a keyboard player in Bon Jovi, could write this kind of inspirational and truly relaxing classical piano pieces. But he does and it is obvious that mr. Bryan is a man of more talents than I early had anticipated. The album is filled with 15 great songs where each and every one of them tells a small story on their own. It's just like going back to the 17th century during the romantic periods. Then it was the title that should give a hint and reflect the instrumental music, and that goes down perfect with this album. The first song, 'Second Chance', is something that to me starts out in two different ways. Both as being a happy and cheerful song, but also having a feeling of a certain sadness over it. It shifts a lot in its moods, thus making you want to know how the story continues. 'I Can Love', a song where the title says it all. The feelings about how it is to be able to love someone. 'It's A Long Road', but to what? Well that is someone for the sole listener to figure out I guess! Here I find a romantic love song, and at least I consider it to be the road of a marriage. It has it's ups and downs, but if you stick with it and don't give up it can blossom into something truly amazing. 'On A Full Moon'. The song that was the title track on the album on his previous album. A song with a more powerful emotional influence. It remains to be a love song, but really display and show the power that goes into it. I for one really feel the passion when he wrote this song..! 'April', is it really needed to say anymore than that? :) Passion and Love all over... 'Kissed By An Angel', a lullaby for a child. A wild guess by me is that this song was written for the girl they had in 1999. It's a really emotional and truly beautiful piece of music. I love this one. 'Endless Horizon' is a piece that, once again, is filled with romance and gentle passion. It has a slow and soothing mood that makes you feel good about yourself and your surroundings. 'Lullaby For Two Moons' is a song I can almost say for certain is a song written for his twins Colton Moon and Gabriella Luna that were born in 1994. It's a song about the devoted love a father has for his kids that he love unconditionally. 'Summer Of Dreams'. Let's get into the car, drive down to the beach and walk along the seashore in the warm sunshine. That says it all.. :) 'Up The River', a great orchestral piece with rich strings that is really beautiful. Half way through David puts in those amazing piano interludes again that just gets to you. 'Netherworld Waltz'. The last word in the title says it all. It's a waltz with a nice harmony.. And to finally end the album he throws in an amazing version of the Bon Jovi song 'In These Arms'. Just David's vocals, who if you didn't know is a VERY talented singer, and his piano. An awesome piece of music and a great way to end this album.. But isn't it like it's been said before? Truly good musicians don't have to use words to say what the mean, they let the notes speak for themselves. And if that's one of the criterias for a good musician, David truly is a master in his field! For those of you hoping to find some Bon Jovi-alike songs here are out of luck. It's a trip down memory lane together with David that takes you for a ride, and where he shows the true essence and emotions that eventually led to some of the best rock songs ever written! Keep it all coming David, we'll be there with you along the way.. You can count on that!